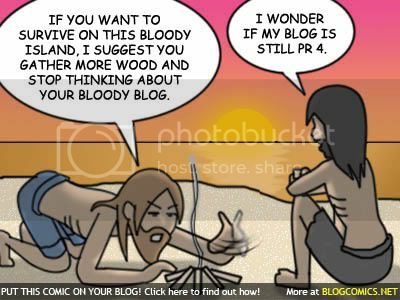 A typical blogger's murmur worrying about his page rank, he should have carried with him a laptop, mobile phone, plenty of batteries and a digital camera so he'll collect hundreds of pictures when a rescuing ship finds them. Can solar battery enough to charge his gadgets? Wish there's an internet cafe in the island lol!